Sooo Stage 7… or was it Stage 6? We couldn’t tell. The outcome of both was inevitably similar on paper and was proven to be so. Stage 7 hair’s width difference finish between Boasson-Hagen and Kittell being the highlight of both stages. The real reason for missing Stage 7 is due to managing non-Marmeladrome work and life, but the transitional sprint stages of the Tour are a bore and a test on even the most die hard fan to sit through and find subjects of interest to keep them engaged. This issue has been highlighted more in 2017 with agreeing to broadcast stages on their entirety. On shorter, more fan friendly profiles this is a brilliant development, but on stages such as 6 and 7 it’s tough to keep the ratings high. We complain when we’ve missed dramatic action early on in the stage due to the TV broadcast starting midway through but if ASO is now proposing to show all stages in their entirety then they need to create a race that lends itself better to being fully televised. Of course, there is a need to have sprint stages and transition stages, but back to back 200+km of flat roads aren’t the way forward anymore. Mini-rant over – onto Stage 8! 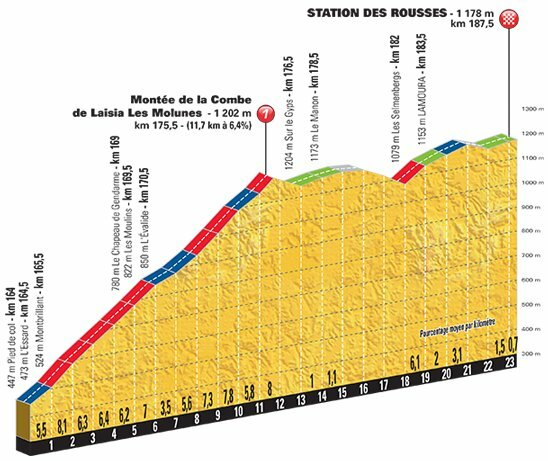 After some more rolling roads, the riders descend down to Saint-Claude for the final, and most testing, climb of the stage. The Montee de la Combe de Laisia Les Molunes, which is a mouthful and befits the nature of the climb, which is a long drawn out affair at 11.7km and 6.4% average. This will be a test of racing at your own pace and where stronger climbers could make others suffer by turning up the heat early on. After the summit, there are still 11km to race and these are again on undulating roads, the perfect point for a loan rider who’s attacked on the MdlCdLlM (that’s one catching acronym) to make it stick. The undulating terrain of Stage 8 lends itself to a breakaway. Also, given that Stage 9 contains 3 HC climbs, the GC race will likely take a back seat today and hopefully the peloton will be content with letting the break fight it out for stage honours. Any breakaway prediction is a lottery and if any of these riders make it into the break they will be strong favourites to take the stage. The key is obviously allowing the peloton to give them enough elastic to make the move stick. Riders like Rolland, Cummings and Felline are arguably the ones in current form. Gallopin hit the deck during the time trial and will hopefully have recovered enough to fancy this stage. Cataldo and De Marchi are no strangers to a mountain heavy breakaway attempt whilst Brambilla won a stage at the Giro and Vuelta last from a small group.